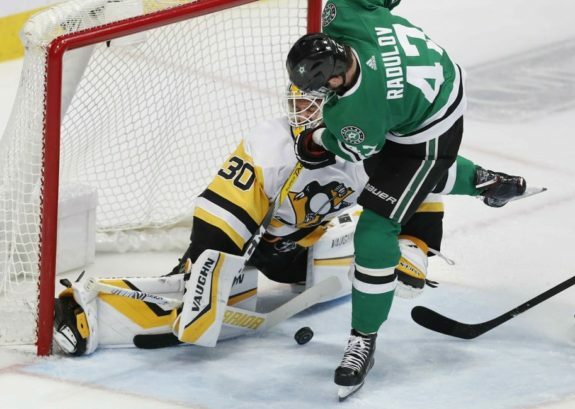 DALLAS — Jared McCann scored twice, including the go-ahead goal on a spinning short-handed play in the third period, and the Pittsburgh Penguins beat the Dallas Stars 3-2 on Saturday night. Dallas was looking for its first lead after Jack Johnson was called for holding and the Penguins were just trying to clear the puck when Teddy Blueger poked it away from John Klingberg at centre ice. McCann took the pass as he was spinning and flipped the puck over Anton Khudobin. NOTES: Stars D Jamie Oleksiak was a healthy scratch in his first game against Pittsburgh since the Penguins traded him back to Dallas in January. The Stars sent Oleksiak to the Penguins in December 2017. Both deals involved a fourth-round pick. … Not long after scoring the game’s first goal, Guentzel was stopped on a one-timer right in front of Khudobin. … Stars F Jason Spezza was a healthy scratch for the second time in three games.